Hang anything, anywhere with our ultra heavy-duty suction cup hook hangers! From bathroom accessories such as loofahs and brushes to kitchen utensils, bird feeders and wreaths to signs and whiteboards - your needs are met damage free, easily and with the highest convenience thanks to our 25lb tested suction cup hooks. Package Content : 6 suction cup hooks. 1. Select a very smooth mounting surface, such as window, stainless steel furniture, super glossy ceramic bathroom wall and bath tub (Attention: some bathroom tiles may look very smooth, but has micro-structures on the surface that are invisible with naked eyes. Suction cups will not work on such tiles!). 2. Ensure the surface is clean and free of oils or residues that will undermine the suction quality over time. 3. Wipe the surface with rubbing alcohol or warm soap water, rinse with tap water at least three times, and then dry naturally or with lint-free cloth. 4. Immerse suction cups into hot water for 5 minutes to soften them up, and then rinse each suction cup in running tap water, and shake off the excess of water. 5. Press suction cup against surface squarely, and press hard to squeeze out as much air as possible. 6. To remove, simply pull up quick release tab under the hook. Due to incomplete cleaning or mounting surface roughness, air bubble might build up inside the cup after weeks or months of use. In case that happens, simply press and burp the cup to prevent the suction cup from falling. #1 Surface roughness: suction cups adhere only to very smooth, non-porous surfaces like glass, fiber glass, polished metal and plastic, super glossy tiles. They do not work on woodwork or concrete. Even some bathroom tiles and plastic may fail. Some tiles may look very smooth, but has very tiny textures or roughness on the surface, and such micro roughness will cause suction cup to quickly fall. 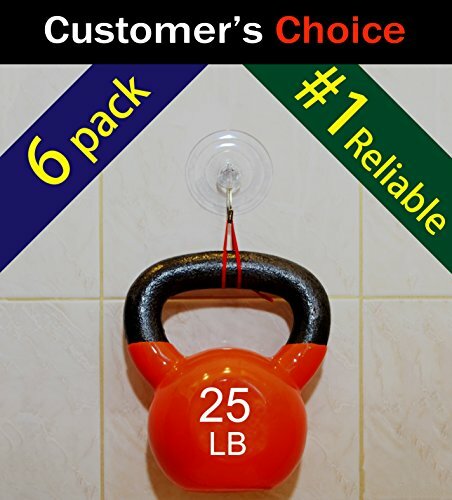 【SUPER HEAVY DUTY】 Rated to hold up to 25 lb for short term and 12 lb for long term, they are the strongest suction hanger and suction holder on the market, thanks to the state-of-the-art injection molding technique we have improved. 【AWESOME RELIABILITY】 The supreme quality of these suction cups allow them to stay sucking for years on good mounting surfaces, holding securely your household items such as wreaths, signs, bird feeders, LED holiday lights, Christmas lights, seasonal decorations, loofah, towel, shower curtain, and many other things, on various surfaces like glass doors and windows, ceramic bathroom tile walls, kitchen stainless refrigerators, etc..
【RUST-PROOF & NON-INVASIVE】 With hook made of stainless steel, and suction cup itself made up of premium quality PVC, our product is corrosion resistant and rust proof, allowing use in humid areas such as bathroom, kitchen, aquarium, fish tank to hold towels, hair dryers, loofahs, shavers, brushes, cooking tools, airline tubes, and many other things. The suction cups are clear and transparent, making them fit into any wall color or background color, without being an intruding patch on the face. 【DAMAGE-FREE & MESS-FREE】 No tools, no drills, no holes, no screws, no glues...With the suction cup technology, everything becomes neat and easy: all you need for installing is picking a very smooth and clean surface, and pushing the suction cup onto it; all you need for removal is unloading the hook, and pulling on the quick-release tab under the hook. Read instructions before use. 【100% RISK-FREE SATISFACTION GUARANTEE】 We also offer you 100% risk-free satisfaction guarantee. If you have any questions or concerns with your order, you can always conveniently contact us. We have an awesome Customer Service Team, and will do whatever it takes to make it right for you! If you have any questions about this product by SillyCute, contact us by completing and submitting the form below. If you are looking for a specif part number, please include it with your message.